Oral surgery is a sub-discipline of maxillofacial surgery and is concerned with surgical interventions related to jaw or periodontium. In our dental practice in Rojales, Spain we offer a wide range of ambulatory oral surgery treatments. 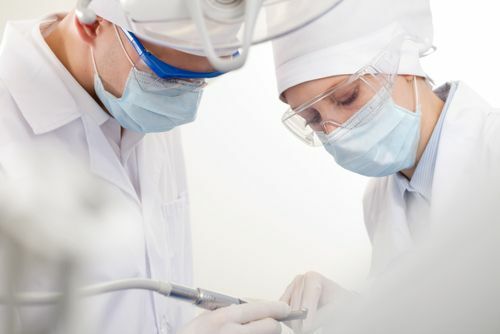 Wisdom teeth can surgically be removed under local or general anesthesia. wisdom teeth put pressure on a nerve, especially in the upper jaw. Here the wisdom teeth need to be removed to avoid headache, tinnitus or jaw joint pain. Teeth beyond repair either from tooth decay, root fracture, or trauma, often present a problem to the dentist. Usually an oral surgeon is consulted in such cases. He is specialized in the removal of crooked or crumbled teeth or teeth which are in several pieces, under general anesthesia. Bone augmentation: sometimes the jaw bone has to be augmented before a dental implant can be inserted. Sinus lift: A “pocket” is made right to the floor of the sinus and bone graft material is placed into the hole. Removing bone material from one part of the jaw and transferring it to another part (usually done to stabilize dental implants). If a front tooth, which has been treated with a root canal, gets infected at the root tip, a root tip resection maybe the only chance to save the tooth. During this intervention the oral surgeon removes the tip of the root. Abscesses (inflammation, swellings, puss formation) on gums or in the jaw can be removed by an oral surgeon and usually treated very successfully. It is absolutley advisable to remove jaw cyst formations. If left untreated, cyst formation in the jaw could harm the neighboring jaw structure, teeth and periodontium. Furthermore they can cause shifting and misalignment of the teeth. If a root canal filling has not been carried out correctly or when root remainders get into the maxillary sinus, the foreign substances can cause inflammation. Here the oral surgeon opens the affected area of the jaw and removes (cleans) the foreign particles. It is very important after a tooth accident (loss or damage of any tooth during a sport, car or motorbike accident) to glue the tooth, or if it’s lost to re-implant the tooth, as fast as possible. Loose front teeth which got loosened can be splinted or interlocked.